You’ve got questions about prenups? Well, I’ve got answers! Check out below our extensive answers to the most common questions I get asked about prenuptial agreements. It is a contract between a couple who is going to marry that sets out their legal rights and obligation when their relationship ends. All relationships end at one point or another – either due to separation or due death. Is a prenuptial agreement legal in Canada? 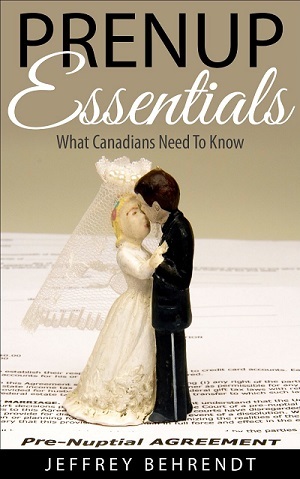 Yes, prenups are legal in all provinces in Canada provided that they follow all the required legal formalities, such as financial disclosure, being witnessed, and in writing. You can check out my extensive article about this here. We are already married. Can we enter into a prenup? Yes you can, but this is a very different situation than for couples who are not married. The reason for this is that once you marry you automatically obtain certain legal rights which you may be giving up in a prenuptial agreement. However, prior to marriage you have not yet obtained those legal rights, so there is nothing to give up. These are called post nups and you can find more information about them over here. My partner and I agree on everything. Can we both hire you as our lawyer? The Law Society prohibits all lawyers from representing both people in a prenup. The idea is that even if the two of you agree completely on everything, your interests are not identical. What may be beneficial to one of you may be harmful to the other. Do we both need lawyers? There are no hard and fast rules, but generally, the sooner the better. Ideally, you want to start the process at least 4 months before the wedding date. That would allow up to 3 months to prepare and finalize the agreement, with one clear month between signing the agreement and your wedding date. The idea behind the clear month is so that there is no pressure on one party to sign the agreement, and there is time after the agreement to change one’s mind if one regrets signing it. If your financial or legal situation is more complicated, then you would want to start sooner, and if your situation is not as complicated, you may be able to start later. If the timing is tight between the agreement and your wedding date, consult with a lawyer as to whether it is appropriate to proceed with the agreement. There are also other options you should consider. The first is postponing your wedding date. The second is what is known as a “stand still” agreement. This is a prenup that basically states you and your partner intended to enter into a prenup prior to your wedding, but were unable to do so due to time constraints. The two of you plan on entering into a prenup after the wedding. The agreement states that if the marriage ends, then you and your partner are to be in about the same position as if the marriage had not occurred. The stand still agreement expires after a time period (typically 6 months to one year), which is the deadline for you and your partner to enter into a properly negotiated prenuptial agreement. The idea behind financial disclosure is that you cannot enter into an agreement about your and your partner’s finances without both of you having a clear understanding of each other’s financial situation. To ensure that this is the case, as part of the process of preparing a prenuptial agreement, you must list out your income, assets and debts, and your partner must do the same. This financial disclosure becomes part of the agreement. A notary is not needed for a prenup. You and your partner will each need separate witnesses when you are signing your agreement. This is simply a clause in your prenup stating that at some point in the future, your prenup is no longer to be followed – normal family law rules will apply. A similar kind of clause is what is known as a review clause. This states that at some point in the future, you and your partner will review the prenup to determine whether it still suits your relationship, and if required, will make appropriate changes to the prenup. It depends on what you are looking for. You can see our fees here. No problem! Just email us on our contact form and we’ll get back to you within one business day. If I own the house 100% before we get married and we live in the house after we get married can that be listed in the prenup as remaining 100% mine? @Moe – Yes, these agreements can be entered into either before or after marriage. The process and effect of the agreement is the same regardless of when it is entered into. The main difference really is that after marriage they can be difficult to complete, as one party simply drags their feet or refuses to sign. I have been married for for 7 years. can I still sign up a financial contract with my wife. @Gary – Yes. There seems to be a misconception that owernship of a matriomial home can’t be dealt with in a prenup. That is not correct – it can be. So, it is possible to state that one person owns the home, not matter what. I was just handed a pre-nup after a bteskaball game this past Sunday. We are getting married in June, and I kind of thought that this was going to happen..and thought I was going to be OK with signing it.Until my lawyer started to read the contract and pointed out some very unpleasant items/waivers etc.As my lawyer soon asked me just what have you gotten yourself into here Terms like going back to a lifestyle to which she was accustom BEFORE ( and it was typed just like that) the marriage . Has made me stop and think about my life before the marriage.I have a wonderful life that includes BEFORE I met him.I own my own business,home,car and 2 dogs. All of which I had BEFORE him.There is no doubt my life with him has the potential to be wonderful,and much different then the life I have now but this contract has made me wonder, just who does he think I am.I am fine and my life will go on with or without him.I do love this man so very much, but I love myself too.Pre Nups can be a good thing,and a sobering thing too. Im a doctor and would like a prenup to say that the business and all the money in the professional corporation bank accounts, and future business profits will remain mine after marriage. I would like alimony to based on my smaller personal income not by larger professional corporation income. Is this possible? @Allan – Yes, it is possible, but there are many caveats. This would need to be discussed in detail with a lawyer, particularly the issue of spousal support. I’m in a position right now where I am with an older man, he is 52 and I am 33. We make farily similar incomes, but he has a sizeable retirement fund and a house that is paid off. I have no assets/savings. Please folks, help me figure out what is fair if we move in or marry. I love him genuinely but the thought of a prenuptial makes me feel insulted. I guess I feel someone should love their partner enough to share half of everything they have if they are going to marry, and furthermore a prenuptial is basically telling the other person that they aren’t worth it. When you marry, I feel the best mentality is whats mine is now ours on both ends, even if roles were reversed. And that also applies if a divorce (God forbid!) ends up happening. A prenuptial is akin to saying I love you but you not enough to share all of me And I am not a gold digger. I just think that when you marry, marriage is an act of sharing and money shouldn’t be excluded! Please don’t take this as an insult. I’m trying to not come off rude, and it’s hard to do so in text, but why do you feel you should be entitled to his retirement fund, and house? He was the one who worked for that retirement fund, and put in many years of service to the company? Also…he obviously worked very hard to pay off the house. You say you have no assets or savings which I’m not sure why this would be his fault. You say you make similar incomes therefore can you not put savings aside? id rather take a needle to my eyeballs than be with any woman in canada…..wholly good lord christ have mercy..what a disgusting human rights violation. I’m sorry Karin but you have no excuse not to signed it. I’m in a similar situation but I suggested the prenup and he agreed we both signed it whatever he has its his and mine is mine because if the marriage ever ends I dont want to take anything from anyone just because they love me. I love him so much that all I want is to be with him. Sign your prenup but if it’s his money you love then find a new man and make your intentions clear so that he doesn’t waste his time on you. Good luck on your future relatio ships. Can a prenup protect me from paying spousal support if were sign it before we enter into a legal marriage? I researched and read that in Ontario even with a prenuptial agreement, i would be entitled to pay spousal suppprt even if the prenup says i wont have to and both parties willingly sign. If that is true, would the same rule apply for Common law? @Kim – A prenup can protect some from paying spousal support, but not in every situation – it would depend on a lot of factors including your and your partner’s financial situation, health, length of marriage, children, career paths, etc. However, at the very least, you can enter into a prenup that will reduce the amount of spousal support you’d be required to pay. Also, living common law generally won’t protect you from paying spousal support after 3 years of living together. Is it possible to get an agreement on just a house you are buying together? I just want to make sure I get back what I put in should anything happen. I put 600k for the deposit and renovations. We are married and that 600k was mine before we were married. If so, how much would an agreement like this cost? @Natalie – Yes, you can do that, and in fact many people enter into agreements just dealing with their house because of the large value of a house and the fact that it is treated differently than other assets under Ontario family law. I had a Prenup created before my gf (now wife) moved it. On the Prenup it states that the house belongs to me and she cannot come after me for any financial or the house. What is hers is hers and what is mine is mine. She is not on the mortgage. I bought the house 16 months before she moved in. She been living here now for almost 2 years. We are about to reach out 1 year anniversary. unfortunately she is asking for a seperation / divorce. Can she still ask for the house even though we have a prenup in place that states she cannot get the house? @Robert – She can ask for whatever she wants – that doesn’t mean she will get it. So long as the prenup was properly drafted and there was proper financial disclosure, no duress, she understood what she was signing, etc. it is very unlikely that her case will be successful. Even without a prenup, after a one year marriage, a court will generally not divide the home equally. If i get divorced and the cash in my bank account is mine and under my name only, is that divided too or just property divided 50%? @Ali – All assets you own on the date your marriage ends enter into the calculation for dividing assets, regardless of the form the assets are in. My fiance and I both want to do the prenup and we both feel that whatever is ours separately will remain separately In whatever we own jointly we will split 50/50. However neither one of us want to list our financial assets and liabilities on our prenup and we even put a clause in the prenup that says we’ve disclosed it to each other privately but do not wish to list it on our greement out of wanting to keep our stuff private from other people. Will this make the prenup invalid since we both agreed to it? In also if we moved to the US would we need to do a new prenup that’s based on the US language or will this agreement generally hold? @Stev – If you don’t make financial disclosure, you are taking a big risk that your prenup will be invalid. You could put a provision in your agreement stating that you both thought financial disclosure was unnecessary and that you both would have signed the agreement regardless of each other’s financial circumstances. But at the very least you are opening yourself up for a possible big legal battle, and one that you may well not win. As for the validity of a Canadian prenup in the US, you would need to speak with an American lawyer. From what I’ve seen in past cases, they generally are valid, but may well be ineffective – i.e. your prenup would still be valid, but would not accomplish what you think it accomplishes.